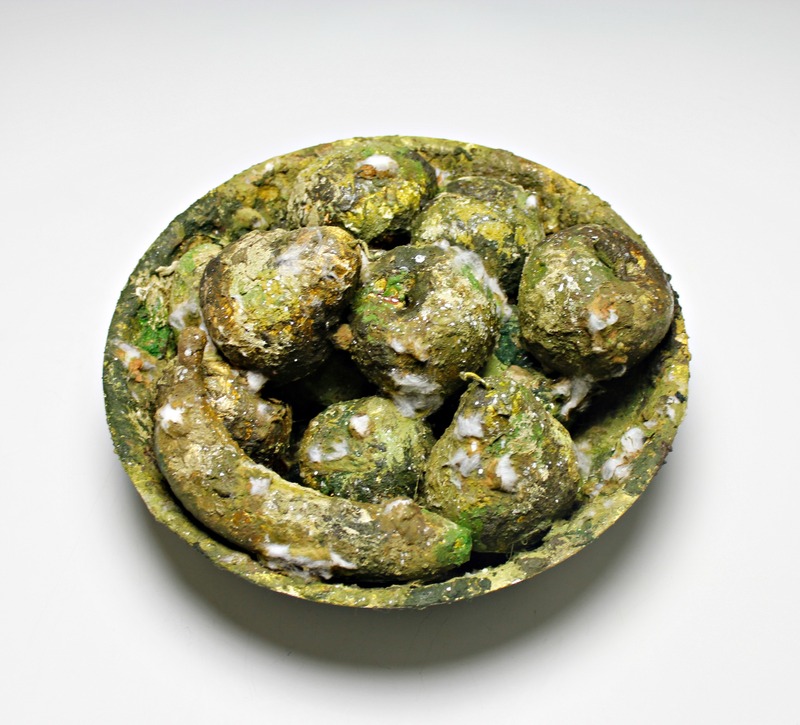 Within the Subject module that I have been undertaking, I have been looking at two elements of food decay: The growth of Decay and its Documentation over time and producing fake mould that captures a frozen moment within the decay process. I have worked with the juxtaposition of the pretend and reality and tried to portray something that people consider to be horrible as more beautiful and accepted. For this Final Piece, I have worked with the idea of capturing a frozen moment, after perfecting the look of producing fake mould through the use of sugar, paint, cotton wool, modelling paste etc. I have decided to use that skill to consolidate my findings and produce a 3D sculptural outcome. The Initial Inspiration for this projects subject matter was a video piece called “Still Life” by Sam Taylor Wood. This piece documents the decay of a fruit bowl and in detail portrays how it decays over a period of time. Without coming across this time-lapse, I don’t think I would have embarked on this project and so it seemed fitting that as a final piece, I make a response to this video piece. 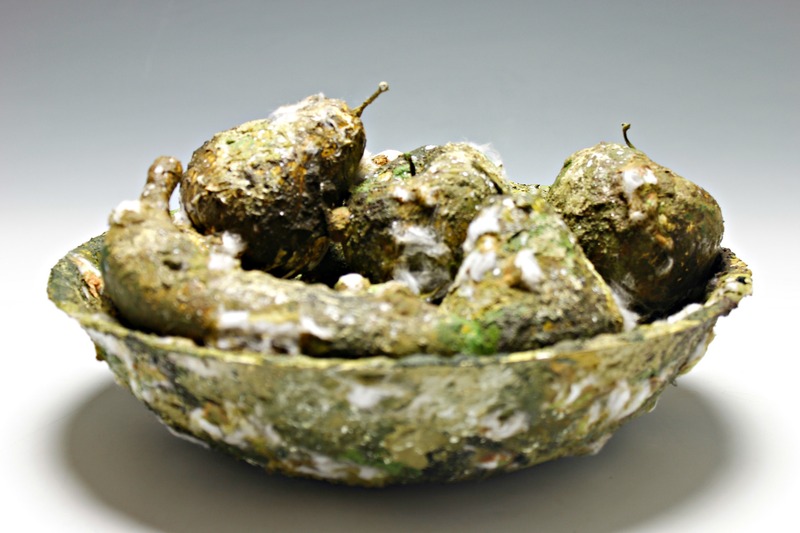 In Sam’s work, She has captured how the fruit bowl changes over time, I have juxtaposed my work with this by almost producing a still of mould and decay overtaking a fruit bowl. There is interesting ideas at work within this piece, there is a strange juxtaposition between the perfectly formed fruit and the replica mould that appears to be incredibly far in the decay process. I believe that this piece consolidates the findings of this project and brings together what I have been experimenting with and learning both conceptually and practically. 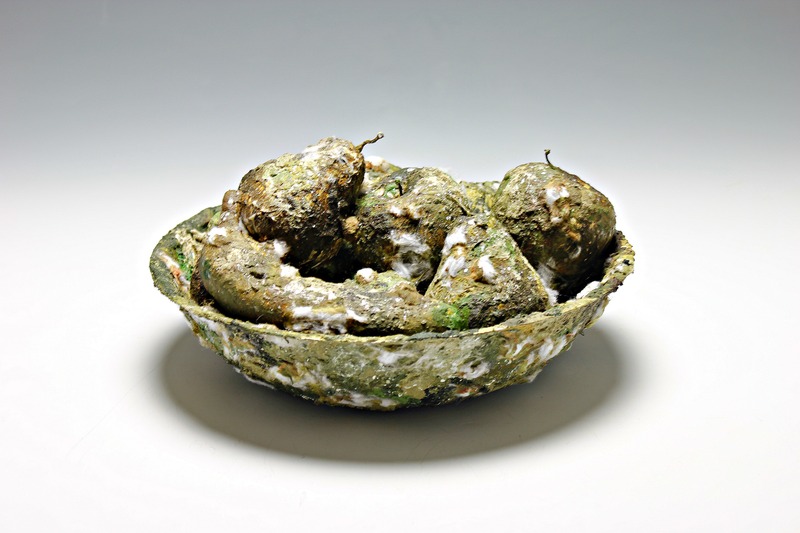 In terms of concept and what I have learnt in my investigation into food decay, this piece highlights the fact that in the right setting, even mould and decay and be appealing and can be a piece of art. It makes people consider it as a piece of art and I think in doing so would and could make some of the public more open-minded about the art world. In think this piece is successful in portraying the beauty of things that typically we would overlook. It makes you want to look at the colours and textures that I have created to replicate mould and from talking to my peers at first it initially makes the viewer wonder what they are looking at and confuses the mind. In my opinion, the piece is quite visually beautiful. I also think it is successful in creating a strong juxtaposition between the perfectly formed fruit and the mouldy exterior. Furthermore, this is a still life, capturing a still of decay and replicating something that would in nature change over time. I think this piece is highly successful in showing what I have learnt, How I have acquired this knowledge and what it has been inspired by. It is almost a homage to Sam Taylor Wood’s work and there is a direct opposition between our concepts. This piece brings an end to my subject module. 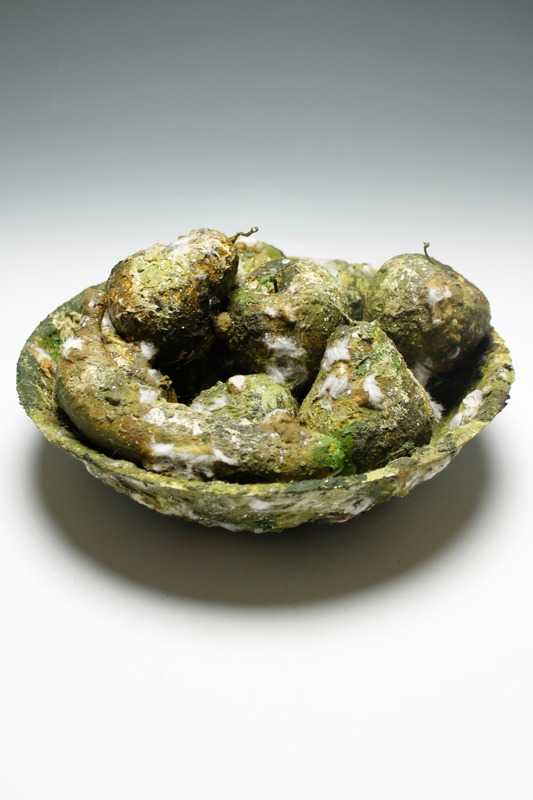 As well as documenting decay, making people question reality and consider mould as art, I believe it is a visually appealing sculptural piece that encourages people to consider mould as an art medium. Even though it is not created from real mould and decay, for a moment it makes people wonder whether it is and broadens their horizons. I think it shows people how much beauty you can miss and makes you consider that things as simple as some mould on a yoghurt in the fridge can be attractive and how much we miss out on and take for granted. Undertaking this project has opened my mind into what I take for granted in nature and has given me the opportunity to document and notice changes undergone during Food Decay myself and to produce art in response to what I see and think about visually. Because this is a final piece, I wanted it to look polished and finalized. I decided to photograph is professionally with lighting and a grey gradient background to achieve shadows and to show the details of the piece on camera. I have thoroughly enjoyed this project, The work I have created within it is not typically the kind of work I would usually create and so it has been incredibly interesting to work out of my comfort zone and I have learnt a lot about myself as an artist and as a person. Blog at WordPress.com. Mid Mo Design.